Diverse Welding Services has recently completed its first works package for the Ichthys LNG Project. Diverse Welding Services Pty Ltd have completed (2) 600 NB Stainless Steel inline Secondary HMP Suction Strainer for the FPSO (Floating Production Storage & Offloading unit). The units were fabricated by Diverse Welding Services for Winnellie Hydraulic Pty Ltd. Together both companies meet the quality and time expectations of the client to reach a successful project outcome. To complete this work DWS, utilised its custom fabricated single sided resistance spot welder to be able to fuse the 0.2mm thick 316 SS woven mesh with a filtration capacity of 300 microns onto the 65% open area 3mm 316 SS support sheet. DWS completed all fabrication using qualified weld procedures and welders. To satisfy the clients stringent quality requirements DWS also have 100% PMI (Positive Material Identification) pre & post fabrication and 100% NDT (Non Destructive Testing) in the form of DPI (Dye Penetrant Inspection). DWS used Perth local NDT subcontractor Inspec Pty Ltd to complete the NDT work scope in our new Oil & Gas Workshop Facility based in Malaga, Perth. DWS thanks Winnellie Hydraulics for the opportunity to work with them on a great project for Inpex, and look forward to future work scope together. We are seeking a welder/fabricator with good welding skills in the fabrication of precision industrial equipment. This position is ideal for someone who takes pride in the quality of their work and is seeking to develop their skills in a high-precision field, with the benefit of long term employment and earning prospects, in addition to a clean, high-tech working environment. A strong work ethic is required; this position would suit someone with experience in stainless and carbon steel fabrication and/or welding. Start your career with Diverse Welding Services Pty Ltd. Diverse Welding Services Pty Ltd (DWS) is proud to announce its twentieth year of producing high quality diverse engineering and manufacturing solutions for the Australian and overseas marketplaces. In an era when manufacturing companies swiftly come and go, Diverse Welding Services has achieved two decades of innovation and steady growth and continues to drive forward. The company will commemorate the occasion with the redevelopment of its plant facilities to comprise two dedicated manufacturing workshops - an Industrial, Mining, Oil & Gas manufacturing facility and a Pharmaceutical, Food & Beverage manufacturing facility. Each facility will feature specialised equipment and an individualised layout to meet the diverse engineering & manufacturing requirements of our clients and industry. DWS began operations in April 1997 when Karl Schmidt - the company’s founder and Managing Director - secured numerous contracts to fabricate and install stainless steel process piping and vessels for various companies in the Food & Beverage industry, including the renowned Peters & Brownes. Through his team’s hard work and extensive industry experience, Karl developed a strong reputation within the West Australian Food & Beverage industry for providing end users with access to a local, high quality, flexible manufacturing and engineering solutions provider – a service which was previously predominantly sourced from the East Coast marketplace. DWS’s commitment to the implementation of its core vision “diversity is our key, customer satisfaction our reward”, has ensured that the company’s flagship product - its people and their quality work - has provided the company the opportunity for continued growth and new opportunities in our greatest asset; positive client feedback and satisfaction. The early success of Diverse Welding Services indicated a growing demand for technically refined, computer controlled welding to reduce failure risk for the Biotech and Oil & Gas subsea industries. Seeing the opportunity, Diverse Welding Services purchased specialised orbital welding equipment and developed welding procedures to the highest quality requirements of both the Biotech industry (FDA and AMSE BPE) and the Mining, Oil & Gas industry (ASME IX SC, NORSOK and ISO). DWS also introduced a quality management system that provides the end user with a complete package of weld execution and traceability documentation. During this time the company established itself as a core vendor and manufacturer of small-bore subsea hydraulic tubing installations for many of the key industry stakeholders, including Technip, FMC, Cameron and Woodside. Diverse Welding Services’ continual upgrading of its existing equipment reflects the company’s ongoing commitment to delivering innovative, powerful, and robust solutions for its clients and industry client requirements. Managing Director Karl Schmidt is quoted as saying: “Our success and longevity is due in part to the advanced capabilities of our team and the continuous improvement of our processes & equipment.” As Diverse Welding Services’ customer base has continued to expand throughout its twenty-year history, the company has continually focused on quality execution of product and services whilst never forgetting its fundamental objective: customer satisfaction. 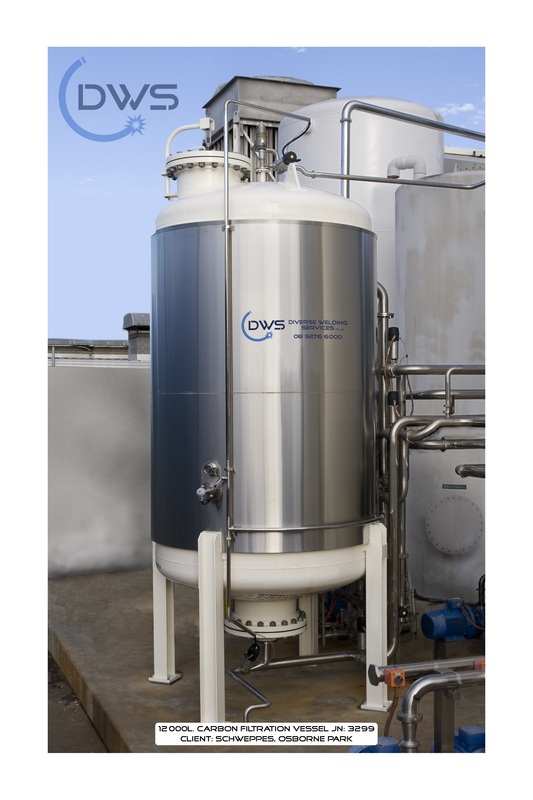 Our activated carbon filter vessel allows for large volume raw water purification and removal of chlorine & other adverse water contaminants through the use of an activated carbon bed. The carbon filter vessel design allows for back washing, regeneration, and or sanitising of the media bed by steam, hot CIP (Clean in Place) caustic. This greatly extends the life of the activated carbon, dependent upon the load placed on the carbon & allows for economical water purification costs and return on investment for the process owner. Our carbon filter vessel is designed and manufactured in accordance with the Australian Standards AS1210 and AS4458. We have all the qualifications required to manufacture pressure vessels, and produce not just a quality product but also the quality assurance documentation package required for this type of pressure vessel manufacture. We have produced carbon filters fabricated from carbon steel & stainless steel. Our filter vessels also offer specialised internal coating systems to ensure our vessels can handle the corrosive environment & duties required. This ensures maximum lifespan of the plant equipment is achieved. From concept to completion...Diverse Welding Services (DWS) in cooperation with PAMS (Petroleum, Aviation & Mining Supplies) have provided a turnkey solution for the design, manufacture, fit out & supply of (3) three Diesel & Bilge Water Hose Reel Cabinets for Lendlease as part of its $96 million dollar Port Hedland Tug Harbour Redeployment & Upgrade. Diverse Welding Services custom designed (3) three stainless steel cabinets based on the client specifications, including engineering of the frame to comply with cyclone, wind and wave load factors. Each cabinet had to be custom designed and sized to fit into an existing barge layout. 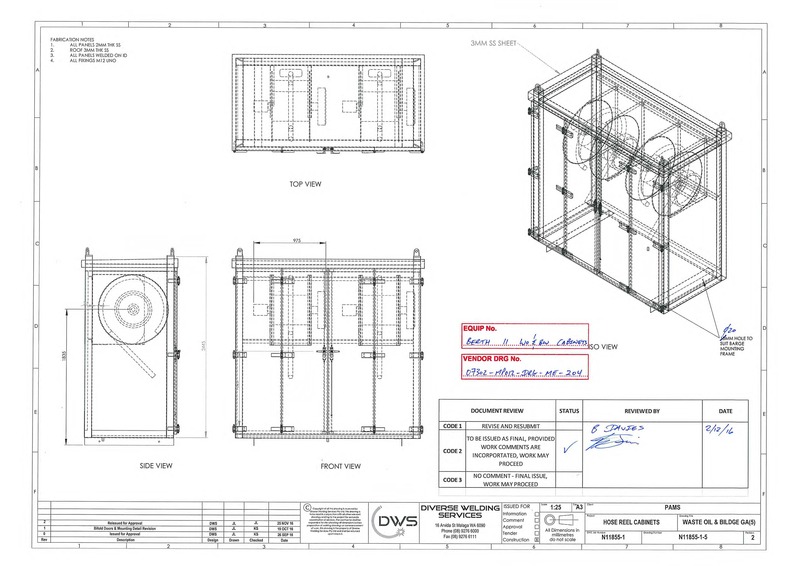 This required Diverse Welding Services to generate Solidworks 3D models & engineering drawings of each cabinet design to allow the client to review and approve prior to fabrication. The cabinets were 100% 316 stainless steel in construction, including custom designed hinges and bi-fold locking doors. Internally the cabinets house 2” and 2.5” Macnaught Hose Reels, process pipework for supply and return of the process media, flow meters, and process valves for flow control. The hose reels required modification and additional rollers so they could be custom mounted in the inverted position. The hose reel modifications were completed in consultation with the OEM (original equipment manufacturer). As the cabinets are installed over a water environment our design included a bunded floor to contain any leaks and avoid environmental contamination. Design included (4) engineered lifting points off the main structure to allow for easy end user installation. The cabinets were fabricated to AS 1554.6 2II, and had 10% LPI (liquid penetrant inspection). All pipework was fabricated to AS4041 Class 1 & was hydrostatically pressure tested and radiographically tested to ensure compliance to Australian standards.